Jamaican popular entertainer Buju Banton won the Grammy for Best Reggae Album in February 2011 for his album “Beyond the Dream,” but it wasn’t until a week ago that he actually received the coveted trophy in his hands. The entertainer was absent from the February 23, 2011, Grammy Award presentation in Los Angeles, because that day was the eve of his trial for drug trafficking in a Tampa, Florida court. That trial concluded with his conviction and subsequent ten-year prison sentence. 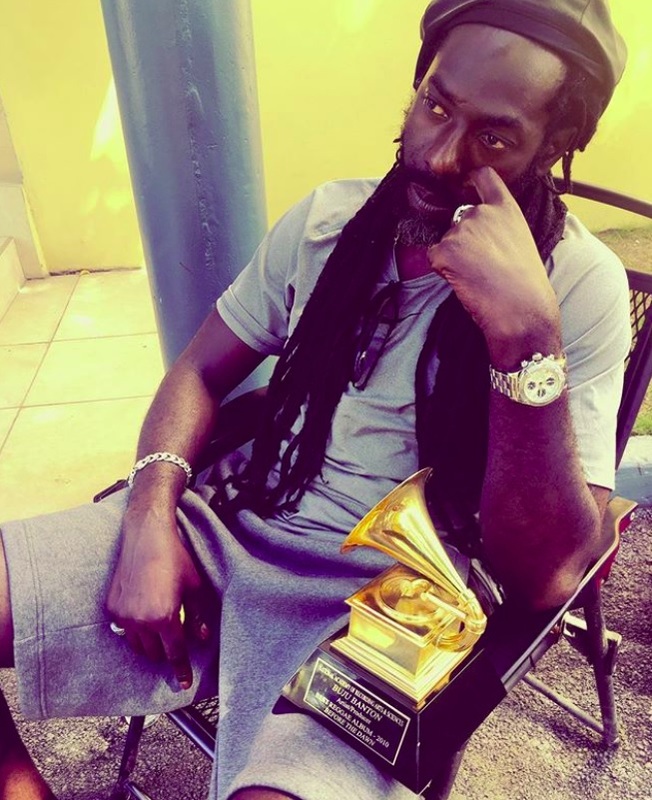 In December 2018, Buju returned to Jamaica after serving his sentence in the US, and last week he finally received his Grammy which had been in the safe keep of his business partner and confidante Traci McGregor who delivered the trophy to him after arriving in the island last Sunday, January 27 at his studio in Kingston. In a post on social media after delivering the trophy, McGregor said, “I have held it in safekeeping all this time… opening the box on my darkest days… a simple reminder of all we accomplished… Finally, it is in the hands of its rightful owner.” The post was accompanied by a photo of Buju with the trophy in his lap. The Grammy-winning album is a 10-track album that was produced by Buju’s Gargamel Music label and released in September 2010. It was his fifth Grammy nomination. His previous nominations were for Inna Heights (1999), Friends for Life (2004), Too Bad (2007) and 2010’s Rasta Got Soul. In 2011 Buju was nominated for the Best Reggae Album with Gregory Isaacs and King Isaac — Isaacs Meets Isaac; Lee “Scratch” Perry — Revelation; Bob Sinclar and Sly and Robbie — Made in Jamaica; Sly and Robbie ‘N’ the Family Taxi — One Pop Reggae; and Andrew Tosh — Legacy: An Acoustic Tribute to Peter Tosh. Since returning to Jamaica on December 7, Buju has finalized plans for his first series of shows, titled “The Long Walk to Freedom which begins on March 16 at the National Stadium in Kingston, Jamaica, with other performances planned for Trinidad and Tobago, the Bahamas, Barbados, and St. Kitts and Nevis. Chronixx, Etana, Coco Tea, Romain Virgo, Delly Ranx, Ghost, Agent Sasco, LUST and the entertainer’s son Jahzeil are included among artistes slated to perform on March 16 show with Buju.